Summer is here and that means it is time to get back up into the mountains! This year’s freshet has been modest compared to last year but water levels are still high and snow is still melting at higher elevations. Plans are confirmed for our GDT Trail Maintenance Trip taking place from July 24 to 27 in the Hidden Creek area. We will be repairing damage to the trail caused by last year’s floods and re-establishing the trail from Tornado Pass to Hidden Creek. We’ll be repairing and building trail tread, removing brush and fallen trees, blazing and marking the trail, assessing damage to bridges and performing riparian restoration as required. Thanks to everyone who has volunteered to come out and help! We are now accepting paid memberships to the GDTA. $30 Annual GDTA Membership gives you up to date information and trip‐planning resources for the Great Divide Trail; voting status at meetings of members of the GDTA; eligibility to serve on the GDTA Board of Directors; invitations to participate in trail classes and volunteer trail projects; and the knowledge that you are helping to protect and preserve the Great Divide Trail. See our website for more information on how to become a member. Our website now has a Trail Conditions page including a ‘Trail Conditions Update Form’ where you can report trail conditions. So if you are hiking on the GDT this summer and see something that other hikers should know about, let us know! 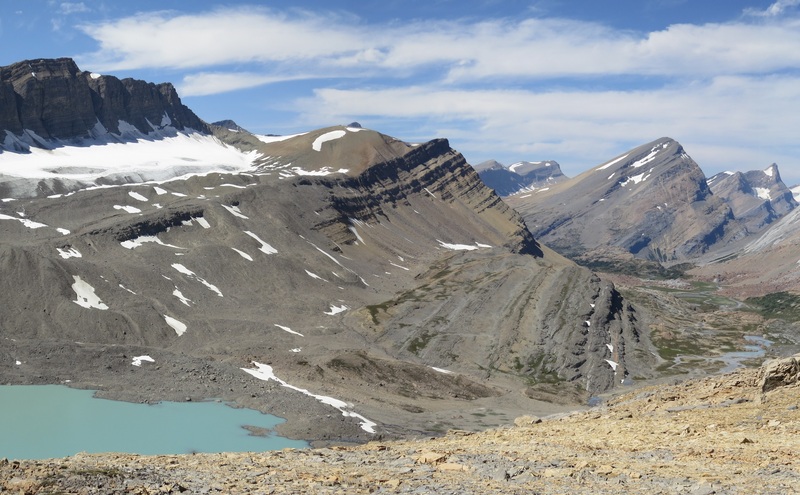 The Great Divide Trail Association Annual General Meeting will be held on Tuesday, September 16 at 7:00pm in Calgary, Alberta; location to be confirmed. Further information will be posted on our website once available. While the snow is melting fast, higher elevation sections of the GDT are still under snow with early season trail conditions = wet and muddy. As a result of last summer’s flood damage to the trail and bridges, some trails remain closed in 2014 (see below). It is recommended that anyone planning to hike the GDT this year research the status of any trails you wish to use and exercise additional caution and allow adequate time to route-find and safely navigate unforeseen obstacles. Elk Lakes Provincial Park: Lower Elk Lakes trail beyond the campground (between Lower and Upper Lakes) and the trail from Upper Elk Lakes to West Elk Pass are closed due to washed out bridges and sections of trail. Use Elkan Creek trail and Elk Pass (east) as a detour. Kootenay National Park: Numa Creek trail is temporarily closed due to a washed-out bridge. Tumbling Creek Trail remains closed for the summer. Cairnes Creek: The bridge is washed out making this a potentially dangerous ford. It is recommended to cross early in the morning when glacial melt is lowest. Highwood House store and gas bar is currently closed. Highway 40 is open from Highway 1 to Highway 541 but traffic is detoured or limited to one-lane in some areas due to construction work south of Lost Lemon Lookout to the junction with Highway 541, in particular near Lineham Creek where a new bridge is being constructed. For more information, check out Alberta 511. Forestry Trunk Road 940 is now open from Highwood House to Highway 532. The section south of Cataract Creek is under construction so expect delays and rough conditions; caution is advised. Highway 532 from junction Forestry Trunk Road 940 to Johnson Creek Bridge remains closed. The Oldman River Road is washed out approximately 10 kilometres from the junction with Forestry Trunk Road 940 with no timetable for repair/re-opening. The Elk River Road accessing Elk Lakes Provincial Park is now open. Anyone planning to hike on the GDT this year, please let us know if we can be of assistance with your trip-planning. The GDTA has many trip-planning resources including maps, GPS and Google Earth coordinates, re-supply information and many miles logged on the trail itself, and we’re happy to help! The GDTA would like to recognize the work of Dave Hockey for his considerable efforts to spread the word about the GDT and increase support for official status of the trail. Check out the GDT article in the Calgary Herald and the GDT feature on Alberta Primetime. Thanks Dave! Like the GDTA’s Facebook page.